American Science and Surplus (USA) (sells a variety of laboratory supplies). Berkshire Corporation ("clean room and controlled environment consumable products to help minimize contamination risks"). Grainger (USA) (sells laboratory supplies - including heat-resistant polypropylene Petri dishes, as of 1/21/2013). Mycosupply (USA) ("Distributors of Mycological Products"). MycoFactory (USA) (formerly Mycobag, sells mycological bag products, pressure cookers and other mushroom supplies). SKS Science Products (USA) (laboratory equipment and supplies). Indigo® Instruments (laboratory supplies including hydrogen peroxide test strips and scientific lab glassware). Scientific and Chemical Supplies, Ltd (UK) (laboratory equipment and supplies, including peroxide). Growing Gourmet and Medicinal Mushrooms, 3rd Edition by Paul Stamets. This new edition of Stamets's definitive text has been expanded by over 150 pages compared to the 2nd edition. 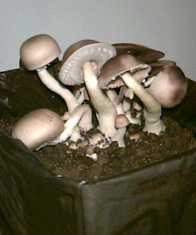 Covers cultivation of 31 species, from oyster mushrooms to shiitake to portobellos. Best available book on cultivation of mushrooms by traditional methods. Mycelium Running: How Mushrooms can Help Save the World by Paul Stamets. This volume details mycelial solutions to ecological challenges. Covers mycorestoration (biotransforming stripped land), mycofiltration (creating habitat buffers), mycoremediation (healing chemically harmed environments), and mycoforestry (creating truly sustainable forests). The Mushroom Cultivator: A Practical Guide to Growing Mushrooms at Home, by Paul Stamets and J.S. Chilton. Somewhat dated, but still the best reference available on growing Agaricus and other compost-loving species by traditional methods. Shiitake Growers Handbook : The Art and Science of Mushroom Cultivation by Paul Przybylowicz and John Donoghue. This document is Copyright: ©2000 by Randall R. Wayne, Ph.D. All commercial rights are reserved. No part of this work may be reproduced or used for sale in any form or by any means without permission of the author.